Arrogate will seek redemption in Saturday’s $1 million TVG Pacific Classic at Del Mar in his first race since finishing fourth in the biggest upset in the track’s history. Thoroughbred racing’s career North American money-winner with more than $17 million in purses finished fourth in the TVG San Diego Handicap July 22 as the 1-20 favorite was beaten by 15 1/4 lengths by Accelerate. The loss in the San Diego Handicap ended Arrogate’s seven-race winning streak that included victories in the world’s three richest dirt races, the $6 million Breeders’ Cup Classic, the $12 million Pegasus World Cup and the $10 million Dubai World Cup. Oddsmaker Russ Hudak made the dark gray 4-year-old the even-money morning line favorite after he drew the outside post position in the field of eight Wednesday for the 27th edition of Del Mar’s richest and most prestigious race. “As soon as the San Diego was over, they started training him for this and everything has gone well,” said Hudak, who said he was never tempted to make Arrogate anything but the favorite. Arrogate drilled four furlongs in 47.6 seconds Monday in his final bit of major exercise for the Pacific Classic. “In a mile-and-a-quarter race there’s a long run to the turn to get position,” Baffert said. Baffert also trains Collected, the second choice at 5-2 who will start at post No. 2. “I would have preferred Collected more outside, but he should be fine from where he is,” Baffert said. Collected won the 1 1/16-mile Precisionist Stakes at Santa Anita June 24. 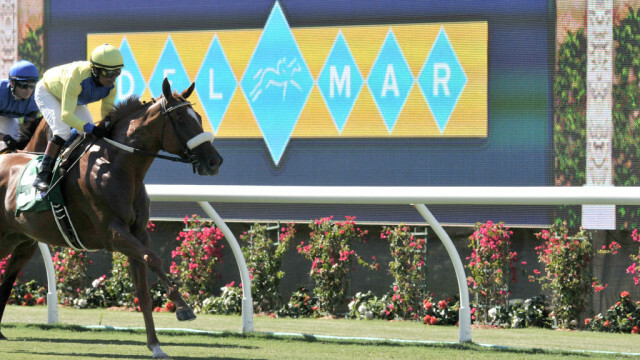 Accelerate has won all three of his starts at Del Mar, which Sadler credited to timing. “I think when he really started getting good was when we ran him around two turns down here,” Sadler said. “He had two or three sprints before his first route race was here and he won easily and impressively. Accelerate recorded his first victory in his fourth career start, finishing 8 3/4 lengths ahead of Curlin Road in a maiden special mile at Del Mar on July 28, 2016. A month later, Accelerate won the $100,000 Shared Belief Stakes, also at a mile. Accelerate was winless in his next five races at other tracks, then was a wire-to-wire winner in the 1 1/16-mile TVG San Diego Handicap. All will carry 124 pounds, with the exception of Sorry Erik, the field’s only 3-year-old and the co-seventh choice at 30-1, who will carry 118 according to the weight-for-age conditions in effect for the race. Horses can be scratched as late as two hours before the race. The winner will be guaranteed a spot in the $6 million Breeders’ Cup Classic which will be run Nov. 4 at Del Mar.